Mental Faculties are, as the name suggests, the instruments by and through which the Mind performs various functions and tasks. It may come as a surprise to some, but observations indicate that these faculties are not exclusive to any individual or group of individuals. Rather, they are possessed by each and every person. However, it can also be argued that the possession of any faculty - mental or other - means little or nothing, if a person is unaware of their existence, or lacks the knowledge of how to best employ them. Going further, and according to some authorities, Man's mental faculties are, for the most part, dormant upon his entrance into the physical world, and, unless they are discovered, trained and developed, will likely remain in that dormant state, during Man's lifetime. Alternatively, if any or all of these faculties are not developed, they are unconsciously applied at whatever level they may currently exist, with the user for the most part unaware of the possibility of obtaining better results than he or she may be getting at present. That having been said, over roughly the last 50 to 60 years to date, people are gradually discovering - or one might say, re-discovering - the existence of various powers, talents and abilities, and making it their business to learn about them and how to use them. As another authority on the subject put it, if indeed Man does possess so-called extra-physical powers (i.e., powers not directly connected or related to his physical body), then they also form a part of his personality, and therefore should be taken into consideration, if we are to have an adequate understanding, of who and what we really are. It is not the intent of this Author to delve deeply into the intricate details of subjects such as psychology or psychiatry, as they may be related to the subject of how the Mind works, but simply to highlight some (if not all) of the underlying philosophical and metaphysical principles which may be said to constitute the Science of Mind, with particular reference here to the subject of the Mental Faculties. 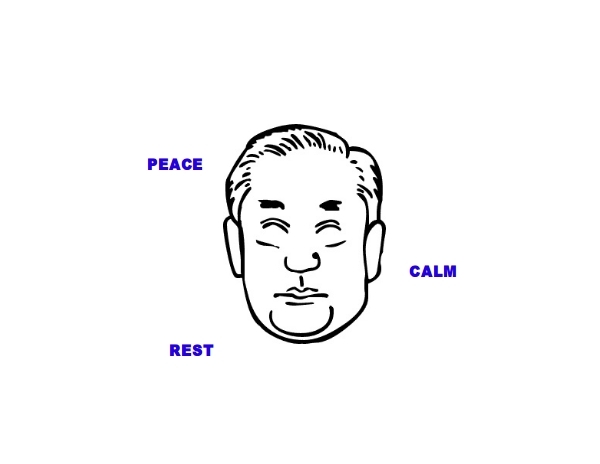 We shall look at each of these Mental Faculties in the general order stated above. One definition of Perception from the dictionary is: the act or faculty of apprehending by means of the senses or of the mind. Expressed another way, we form a conclusion about a subject or object, either via the information gained via the physical senses (sight, hearing, smell, taste and touch), or via the ideas we formulate regarding said subject or object. In a general sense, Perception may be interpreted as being a point of view. Another interesting point about the working of the mental faculty of Perception is that it may be aptly considered to be relative, i.e., the perception formed is a direct result of how an individual so-to-say approaches the subject or object in question. 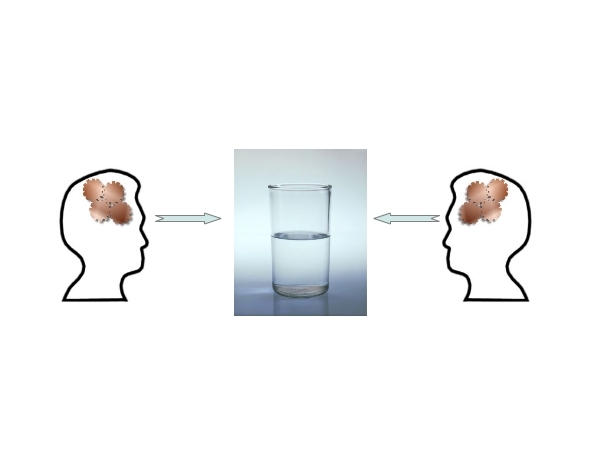 Just as a simple example, two persons look at a cup or glass that is filled with water or some other liquid to the half-way level - one person's perception is that the vessel is half-full, while the other's is that it is half-empty. The above illustration also highlights a most interesting point - the same subject or object may appear to be different, if and when viewed from different perspectives or viewpoints, but from each perspective, they both appear to be correct. And it applies just as equally to the physical world, as to the non-physical world - the world of ideas. Evidence of this can clearly be seen all around. One perceives opportunity, while simultaneously, another perceives lack or absence of opportunity. One perceives safety and security, while simultaneously, another perceives danger and uncertainty ... and so on. And when all is said and done, both parties are simply using that mental faculty of Perception, in opposing directions. It can also be put forward that Perception is also synonymous with Belief, i.e., it refers to what a person perceives as an actuality (i.e., what is considered to be true). B) Ideas which they have formulated and which reside in their objective or conscious mind. Once again speaking generally, and especially in this time period often referred to as the Age Of Information, it has often been remarked that Man is constantly exposed to a myriad amount of information, from numerous sources, and there are naturally occasions where a person will find themself exposed to various ideas, concepts and suggestions which, on investigation and comparison, conflict with one another. Psychology and kindred studies tell us clearly that it is very difficult, if not simply impossible, for any person to hold two or more conflicting ideas in their mind at the same time, and be able to operate or function in any sort of effective manner, because they are operating from a state which is aptly described as confusion, dis-order or chaos. Fortunately, a person does not have to entertain the state of confusion, because they can employ the mental faculty of Reasoning as a "filter", and so, even if they might not completely block out every piece of information deemed unwanted, they can effectively choose the information that will reside in their conscious mind. 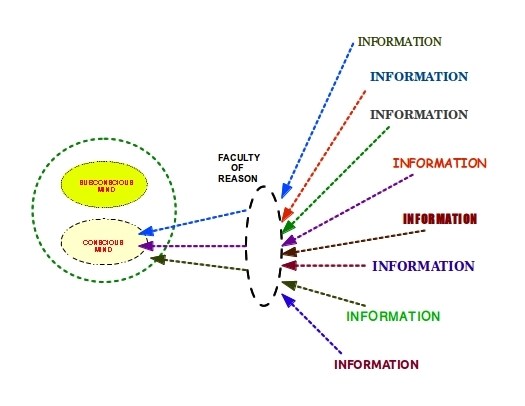 It should be noted that the diagram only seeks to clearly illustrate the working of the mental faculty of Reasoning, but it should not be inferred that the Reasoning faculty is something separate from the mind. On the contrary, it, like all the other mental faculties, is an essential part of the mind and its working. 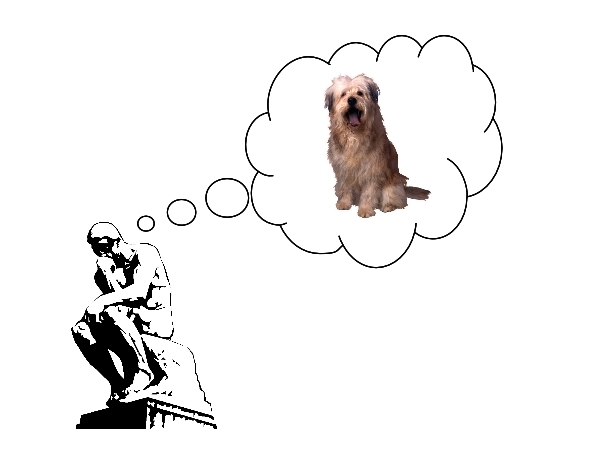 In fact, observations indicate that there exists two modes of Reasoning that are associated with how the mind works - namely, the subconscious mind operates solely by Deductive Reasoning, whereas the conscious mind operates with both Deductive Reasoning, as well as what is called Inductive Reasoning. Both of these modes of Reasoning shall be touched upon in further detail in another section. Imagination, or Visualization, may be simply defined as the formation of mental images or pictures. It has been deduced and is generally accepted, that whenever a person forms a Thought or an Idea in their mind, he or she is actually forming an image which corresponds or matches the particular Thought or Idea. For example, if a person thinks of an animal - say, a dog - they don't particularly think the word "DOG" - they almost invariably form an image of a dog; whether it be a dog they have encountered at some previous moment in time, a dog seen only as a picture in a book, etc. In terms of how the mind works, the proper employment of the mental faculty of Imagination imparts clarity to the Thought or Idea being formed; thereby the thinker is able to express their idea clearly to themself or to others, if they so desire. Also, with respect to using their mental faculties to aid them in accomplishing some particular goal or objective, and as stated before in one or more previous sections, it can be propositioned that a clearly-defined mental image impressed upon the subconscious mind is far more likely to lead to the creation of corresponding circumstances, than an indistinct or constantly varying or fluctuating mental image. And it is well that another of Man's mental faculties, when understood and rightly employed, is able to maintain a mental image clearly, so that the Creative Process, which ultimately creates the corresponding conditions, may complete its work in a relatively short period of time. That particular mental faculty is known as the Will. As briefly mentioned in the preceding paragraph, the proper use of the mental faculty of Will, is, so-to-say, to keep a particular mental image "fixed" in the mind. It may surprise the inquirer to know that this is far simpler than it may first appear, once they properly understand what the Will is, as well as what it is not. There was a time when the erroneous conception was formed - and that erroneous conception may still be present in some areas - that employment of the Will involves the exertion of a tremendous force, accompanied by exertion, strain or great effort - what the ordinary layman might describe as "will-power". In response to that erroneous conception, it can be proven that, even if there have been or are cases where will-power has produced visible results, it has also been found that such results inevitably do not last. This is primarily because said results are brought into being via the exercise of an force or creative agency, which is un-natural, i.e., said agency has no inherent vital force in itself, and only exists, as long as the mind which set it in motion maintains it. However, sooner or later, the mind which has set this un-natural agency into use becomes (literally) exhausted, and once that happens, the agency dissipates, and in turn, the results obtained will inevitably dissipate also. The inquirer may either take it on faith, or investigate for themself, but it can be proven that proper employment of the Will requires absolutely no strain, exertion or great effort, whatsoever, for its employment. Rather, it may be considered, to paraphrase the words of an authority on the subject, "... a calm, peaceful determination to retain a certain mental state or attitude, in spite of any or all temptations to the contrary,..."
It is also worth mentioning that the proper employment of the Will may be likened to Making a Decision. The subject of Decision is not specifically being addressed here, but this author will only mention here that, when a person truly comprehends what a Decision is, they will realize that, if or when a Decision is properly made, it is made "once, only once, and once for all time". And it could be considered absolutely the same, regarding the employment of the Will. 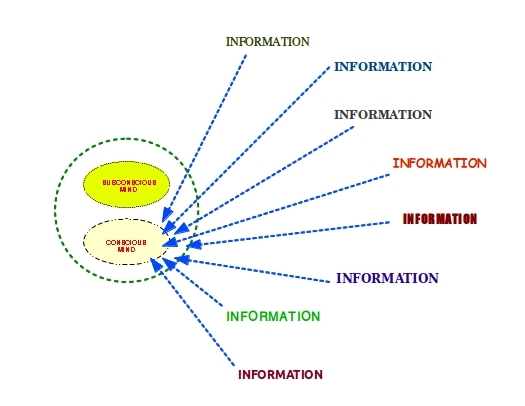 experiences, etc., may be generally summed up by the term: Information. Now, over roughly the last ten years or more, various studies has been conducted to ascertain the capacity and capability of the human brain to store and retain information. It would seem that no definite quantitative value of storage capacity has yet been established, primarily because Man cannot as yet claim to know all that there is to know about the brain. It should also be noted that any estimates of information storage capacity as related to the brain are adjudged from the physical standpoint, and there is nothing inherently wrong in doing this. However, if the matter is approached from the metaphysical standpoint, something rather significant comes to light. The metaphysical approach, generally, takes up the position that the Human Mind is not the Human Brain - also that the Mind does not "reside" within the Brain. Rather, the Brain is the primary instrument through which the Mind operates. In fact, some schools of reasoning go further and take up the position that the entire Physical Body is the instrument by and through which the Individual Mind interacts and corresponds with the physical world. In addition, and from one or more previous discussions, it has been deduced that the All-Originating Entity, which is also referred to as Universal Mind, is, as the term "Universal" suggests, an Infinite and Eternal entity. This in itself has great significance. 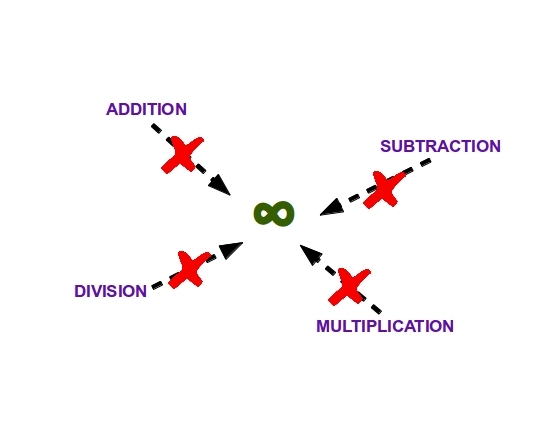 The inquirer who may possess a mathematical bent of mind may grasp this faster than the so-called "non-mathematical" person, but it can be traced out that no mathematical operation (addition, subtraction, multiplication, division, etc,) can be applied to Infinity or an Infinite entity. Any such operation that could operate upon Infinity would introduce limits as to where one thing ceases and another begins, which contradicts the concept of Infinity, which itself cannot have any limit, otherwise Infinity could not exist. And, as also stated in one or more previous discussions, the Individual Human Mind is, so-to-say, a reproduction of the Universal Mind, acting on the plane of the particular world of the individual, yet it is not a separate entity from Universal Mind. Therefore, the Human Mind is likewise an Infinite and Eternal entity. Furthermore, it has also been traced out and deduced that everything in the physical universe is some form or mode of manifestation of Universal Mind, and that the only mode of action that can be attributed to Universal Mind is Thought - from which one can draw the conclusion that Thought is, in itself, Infinite and Eternal. On the preceding basis, it can be deduced that, since all that constitutes the physical universe is ultimately some manifestation of Thought (which is infinite and eternal), then the mental faculty of Memory, from the standpoint of the Human Mind (as opposed to the Human Brain) is, literally, Infinite in capacity. This does not, however, necessarily mean that any and every person can immediately draw upon the infinite quantum of information that actually exists - at least, not from a practical standpoint. Theoretically, it is possible, but from the practical position, this can only occur, if or when a person recognizes and realizes that he or she can do so, and not otherwise. One meaning of Intuition is: "the direct perception of truth, fact, etc., independent of any reasoning process". Expressed another way, Intuition is the realization and recognition of some particular condition or occurrence, where said realization and recognition transpires with seemingly little or no involvement of the individual's physical senses. The revelations made in one or more previous sections - particularly the discussion regarding Thought Power - can give a sound basis to explain how this occurs. 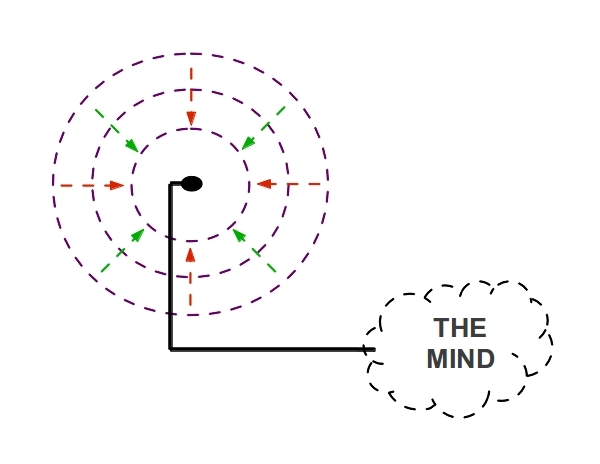 From that discussion, it was put forward that Thought is capable of (literally) setting up a broadcast of vibrations in the Ether or Universal Medium of a particular frequency, and that these "thought-waves" were capable of detection by a receiver (i.e., a mind) tuned to the same frequency. In addition, the Law of Vibration, which was referred to in that previous section, also postulates that everything in the so-called "physical" universe, is actually broadcasting vibrations of a particular frequency - whether those vibrations are detectable by physical science or not. This applies not only to actual physical objects, but also extends to so-called "abstract" concepts, such as conditions, circumstances, situations and events. As one authority put it in our present time, we all literally live, move and have our being in "an ocean of motion", i.e., we are all immersed in a multitude of vibrations, emanating from multitudinous sources, and, whether we are consciously aware of it or not, each of these vibrations are capable of producing some effect upon us. 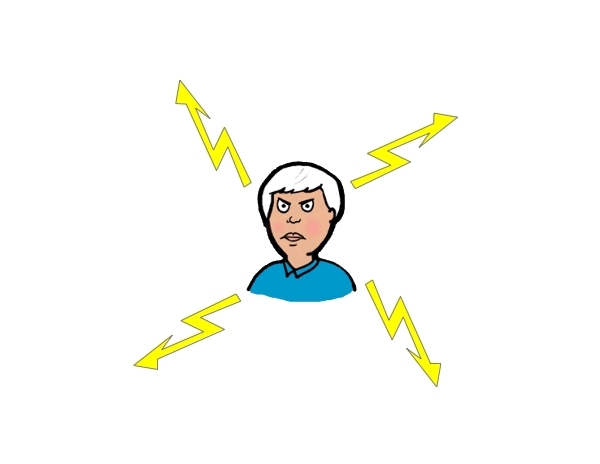 The principle is similar - if not the same - as the phenomenon of radio, where a transmitted signal of a particular frequency can only be detected by a receiving device tuned to that frequency. Whether any thought-wave of a particular frequency does affect us or not depends primarily upon our recognition and realization of the powers, properties and qualities associated with our minds, and our personal application of said powers, properties and qualities. In addition, it has been put forth that, so far as our knowledge to date goes, Man is the only life-form on the planet who demonstrates the ability to choose his Thoughts, via the mental faculty of Reasoning, and thereby, to ultimately determine the particular frequency with which he shall send vibrations forth into the universe, and conversely, he has the potential to sense the vibrations reaching him from anyone and anything else. He may not register the vibrations reaching him in terms of being able to state some numerical value, but the sensing of vibrations from some source outside of himself may be best described as a Feeling. This is, in essence, the modus operandi of the mental faculty of Intuition, i.e., to detect the vibrations projected by external sources outside the individual, in similar manner as an antenna detects the signals around it and transfers them to a receiver. And, as one authority on the subject of the working of the Mind put it in his time, "the Sum of the Vibrations in anything determines the mode, power, and direction of its action", i.e., the frequency associated with anything - whether it be a person, animal, plant, or inanimate object - can be considered an accurate and infallible indicator of the actual state of that thing, even in spite of any indications which register on the physical senses. 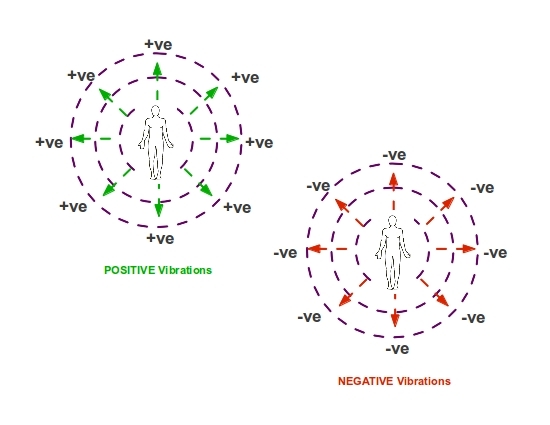 There are reports to be found of persons who have "felt bad 'vibes' (vibrations)" regarding some person, place or thing, and having detected such vibrations, chose to keep themself away or apart from these sources of so-called "bad" vibrations, to discover later that some unfortunate event transpired in or around that source, from which they actually rescued themselves. And converse reports can also be found of persons who detected "good" vibes, and acted upon their detection, to their ultimate benefit. In closing, a point mentioned at the beginning of this discussion will be re-emphasized - namely, that the various Mental Faculties discussed here are not the exclusive property of any one person, or group or class of persons, but rather, they are actually "part and parcel" of the personality of each and every human being. Accordingly, it is recommended - not only by this Author, but it has also been recommended by many others - that it would be in the best interest of any person who, so-to-say, comes to realize and recognize that they do indeed possess these Mental Faculties, that they should endeavor to learn and understand them, so as to properly make the best use of them, in every conceivable area of their lives. In respect of introducing a person to Mental Faculties, probably at this time, there are few better sources of reference than the material and information taught by internationally-renowned personal development expert, Bob Proctor. Accordingly, the following web link is provided for the specific purpose of providing reference and further research material, thereby gaining further insight into the subject of the Mental Faculties, according to his particular approach. Clicking the link opens a new window.